The Starfarers of Catan 5-6 Player Expansion adds two more players, new solar systems, and a new alien raceâ€¦ The Wanderers, to your Starfarers of Catan Game. 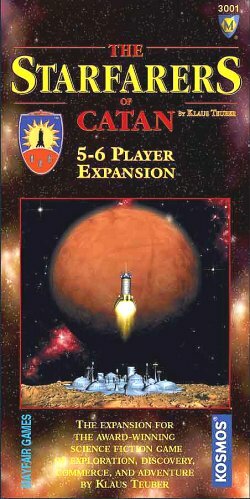 This expansion contains everything you need to include two additional players in the Starfarers of Catan, the exciting, fast moving, science fiction game. Here you'll find 2 mother ships, 2 sets of playing pieces, additional cards, 2 reusable game board overlays, and a new alien race ripe for encounter. Note: Requires The Starfarers of Catan to play.